Thodoris Dritsas, minister of shipping and island policy, told Deutsche Welle (DW) that ethnic groups will remain separated on the ships, as it is suspected that ethnic tensions may have played a role in the fire that destroyed nearly 60 percent of the camp, displacing over 4,000 people. He added that families will be given priority in the temporary accommodations, and those who are not able to be housed on the vessels will be lodged in new tents. There were no casualties reported as a result of the fire, and an Athens police official said nine people were arrested in connection with the incident, on suspicion of causing civil unrest and destroying property. 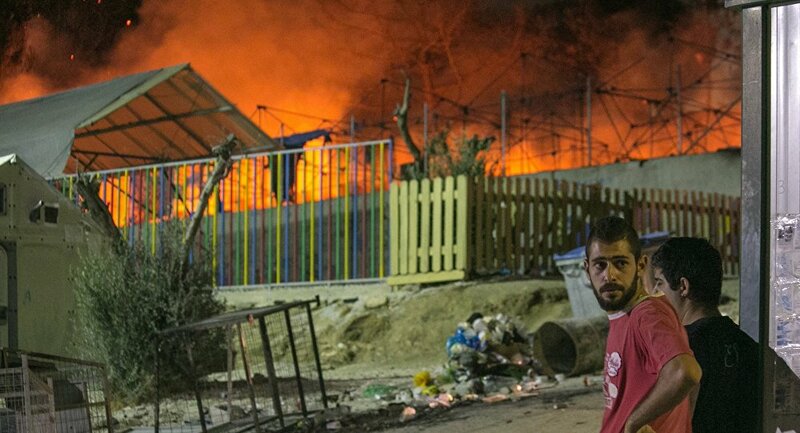 The Moria refugee camp had problems before the blaze, including issues of scarcity, squalor and overcrowding. Fred Morlet, director of volunteer coordination at the camp told DW that Moria was "the worst refugee camp in the world." The Holland-based Live for Lives foundation makes 1,500 meals a day for refugees, but founder Ramona Brongers told the German news agency that this often isn’t enough. "We are helping as much as we can, but the problems are huge and larger organizations won't take responsibility," she said. According to Brussels-based European Commission spokeswoman Natasha Bertaud, there would be very few transfers from Lesbos to the Greek mainland. She said "To avoid secondary movement to the rest of Europe, that means keeping asylum seekers on the islands for the most part. The refugees are bound by a deal struck in March between Turkey and the European Union, dictating that migrants can only have their asylum documents processed if they stay on one of five Aegean islands. The agreement was a response to more than a million African, Asian and Middle Eastern refugees that have flooded EU member states since 2015. "They don't know when their asylum claims will be processed. Some people feel they don't have enough information," said Roland Schoenbauer, a spokesman in Greece for the UNHCR, the UN’s refugee agency, said that people are "sick of waiting" in the camps.